On the heels of my post yesterday about 84 Lumber’s liberal-leaning Superbowl ad, I felt the need to share that liberal does not necessarily equal smart. Both my of my senators, Chuck Schumer and Kristen Gillibrand, have gone on record against Ms. DeVos. The ACLU has my address; they know there’s no point in my calling my own senators. Yet here we are. Kept your powder dry. You could have suppressed anyone from a state where both senators oppose Ms. DeVos and thus saved the opportunity to email me at a time when I can actually be of help in New York. Given me an alternative. They could have asked anyone in a state with two Democratic senators to badger friends in other states, especially the Badger State, where Ron Johnson supports Ms. DeVos. They could have asked me to share the organization’s point of view on Ms. DeVos via social media. Hell, they could have asked for a few more bucks. If we want to protect our sacred civil liberties, we will need courage. We will need faith in the fundamental decency of the American public. We will need legislators and jurists to do their jobs in acting as a check on executive power. We will also need better email marketing than this. 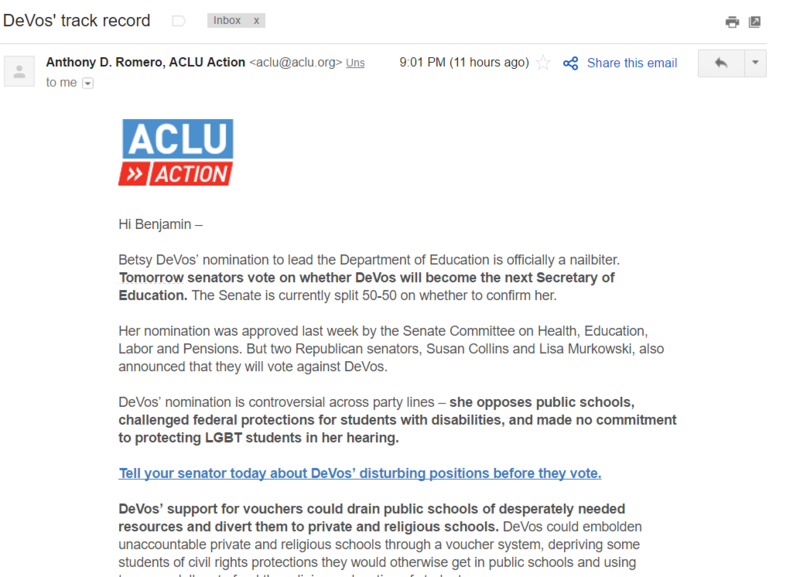 This entry was posted in Data, Digital Marketing, Email Marketing and tagged ACLU, badger, betsy devos, chuck schumer, kristen gillibrand, ron johnson, wisconsin on February 7, 2017 by Ben.